Bit of a delay since my last post due to wi-fi connectivity issues which I won’t go into as it was a traumatic time! If you haven’t experienced it believe me, in a house with 2 adult children, bar the entire house going on fire, having no wi-fi is guaranteed to cause a few epic melt-downs and stress levels to go sky-high. We still had food, electricity, a roof over our head, even a TV, but no wi-fi ….you get my drift! 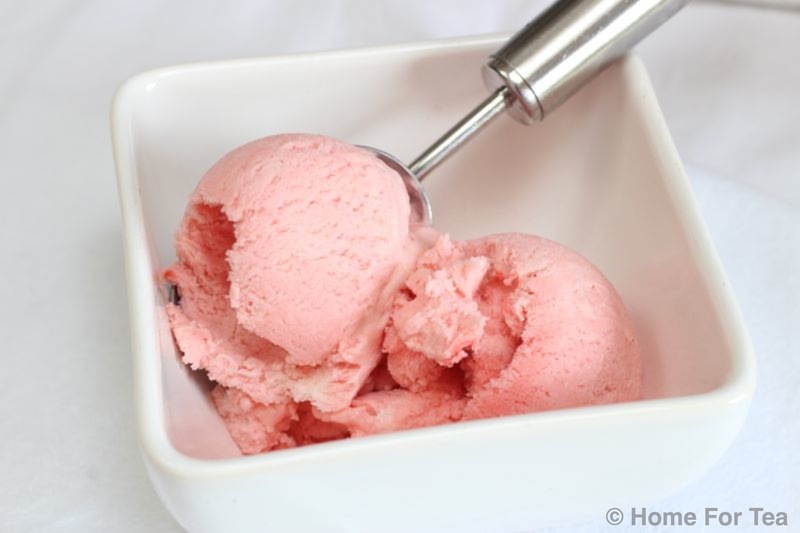 Anyway if you are feeling a bit sad to see Summer come to an end and stressed having to get organised again with meals / school lunches / uniforms etc cheer yourself up with this week’s recipe for the most fabulous strawberry ice cream. 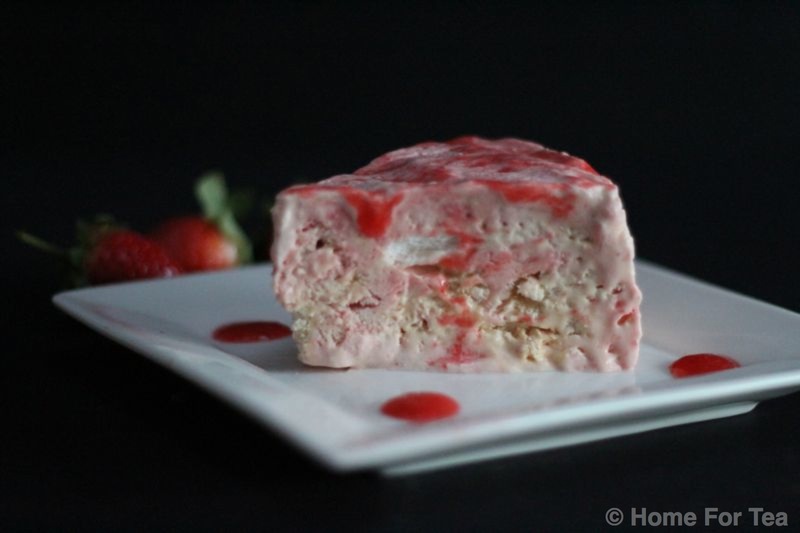 No need for any fancy ice cream machine here to make this delicious ice cream with a wonderful fresh strawberry flavour. Serve it on a cone or with some fresh strawberries. Yum! Purée the strawberries with the lemon juice in a blender or food processor. Push the purée through a sieve to remove the seeds. Place the sugar and water in a saucepan, and heat slowly, stirring to dissolve the sugar. Still whisking, gradually pour in the hot syrup in a thin stream and continue to whisk until the mixture is cool, glossy and stiff (about 4/5 minutes). Fold in the strawberry purée and the whipped cream, though not completely so as to give it a nice marbled effect. The ice cream can be scooped / served straight from the freezer. A treat for someone you love! I thought I would post this recipe again as it is such a yummy dessert – an absolute winner, guaranteed to impress and have people asking for seconds. Perfect for a dinner party or a romantic dinner for 2 and because it is prepared in advance there is no stress on the night. 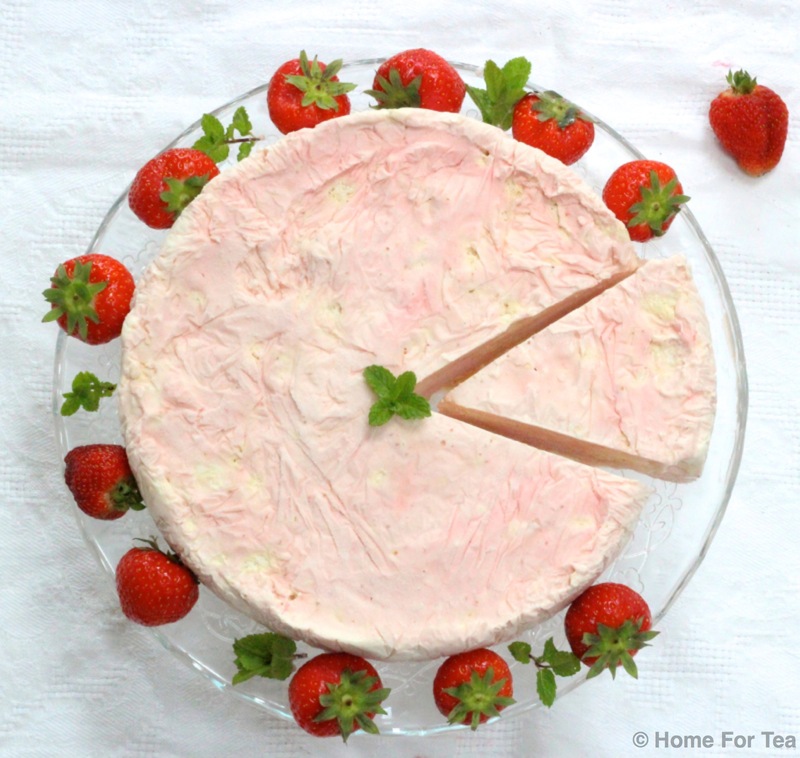 Imagine strawberries & cream, strawberry ice cream and meringue all combined into a delicious, beautiful ice cream cake. All you have to do when you want to serve it, is take it out of the freezer, leave it for about 5 minutes and decorate with some fresh strawberries. Don’t be put off by the length of the instructions as each step is really easy. I do this in two stages – make the meringues in the evening and leave them to dry out in the oven overnight (with the oven door ajar). Then the next day whip the cream, whizz the strawberries, mix it all together, scoop it into the tin and pop in the freezer. Add the sugar, 1 tablespoon at a time, whisking between each addition. Continue whisking until all the sugar has been added and the meringue forms stiff, glossy peaks. Using a large spatula or metal spoon, fold in the vanilla extract. Bake in the oven for about 30 minutes. (To test whether the meringues are ready, gently lift up one and press the base – it should be crisp but give way with a bit of pressure. If possible, allow to cool down completely in the oven, with the heat switched off and the door slightly ajar. Transfer the cooked meringues to a wire rack – they will crisp up further as they cool. Line the cake tin with a double layer of cling film. Crumble the meringue into the whipped cream and stir together to mix. Add the strawberry sauce, swirling it through the cream and meringue mixture. Tip the mixture into the lined cake tin and smooth the surface with a spatula. Wrap the tin in cling film and freeze for at least eight hours or preferably overnight. To serve: Take the frozen cake from the freezer, unclip the tin and carefully lift out the ‘cake’. Remove the cling film from the sides of the cake, then use a palette knife or metal fish slice to carefully transfer the cake from the base of the tin to a serving plate. Cut into slices to serve, either on its own or with fresh strawberries.